"Canada has a long history in satellite systems spearheading many innovative applications and solutions both in terms of satellite communications and scientific instruments. From its debut with the Allouette program in the early 1960�fs analyzing radio frequency propagation from space,..." Dr. Belisle and Dr. Caron of CRC give comments on a Canadian perspective of satellite communications. JAXA launched the Quasi-Zenith Satellite 1 (QZS-1) called �gMICHIBIKI�h on September 11th 2010. 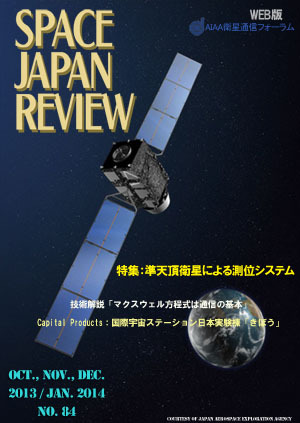 After the on orbit checkout for 3 months, JAXA started technical verification of satellite navigation technology using MICHIBIKI. On June 22nd 2011, MICHIBIKI navigation signals were set healthy when the performance of MICHIBIKI met the IS-QZSS (Interface Specification for QZSS). This paper describes the technical verification results of QZS-1 �gMICHIBIKI�h.